I am weary. The packing and now cleaning is still ongoing, the end is neigh, and moving day begins to tentatively loom. 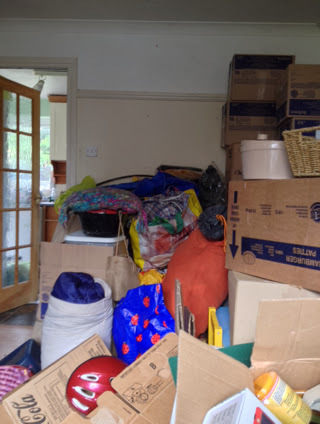 I am conscious I am going from a house to 3 rooms, and I look around and wondered if there's still too much - the skip is full though, and the wooden toys have been decimated; either sold or passed on. And I remind myself those boxes are quite small.. And I may be moving into 3 rooms; the size of those rooms means I'll have about the same amount of space as I do now (maybe even a bit more) Plus the communal areas - oh how I will appreciate those communal areas, and a large house where the noise children make becomes a joyful playful racket, and not an ear splitting din. Oh yes, that will be wonderful, and housemates, ooh I'm looking forward to having housemates. Looking forward to new knowledge, new friendships, to city living, to a whole new way of living.